In small size currency, prior to the Series 1996 $20, $50 and $100 notes, a note's serial number uniquely identifies that note within the note's type, denomination and series. The serial number on small size currency was standardized to eight digits, with a single letter prefix and single letter suffix. All letters but "O" are used in the prefix and suffix letters - more or less. Using this numbering scheme, we have 99,999,999 possible digit combinations, by 25 possible prefix letters, by 25 possible suffix letters, producing 62,499,999,375 different combinations. If they used "00000000" it'd be an even 62,500,000,000 combinations, but they don't. Presumably, if this ever happened, they'd have had to start a new series to allow them to reset the serial number back to A00000001A. Fortunately, this never happened. What did happen was that occasionally, errors would be made in the printing process, and those errors would be caught before released into circulation. Those notes would be destroyed and replaced with a note that had a "*" in place of the prefix letter, and serial numbers starting with *00000001A. Should *99999999A be printed, the next "star note" would continue at *00000001B. This added another 2,499,999,975 possible combinations, which of course, probably never happened. As with the other types of notes, those replaced due to errors in printing contain a "*" in the serial number, this time as the suffix. 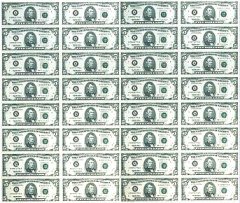 Thus, for each Federal Reserve Bank, there are 2,499,999,975 possible regular serial numbers, plus 99,999,999 possible star notes. Having recently seen $1 notes in the B..X block, I have to think that this has probably already happened. What they've done about this, I don't know. With the introduction of the Series 1996 $20, $50 and $100 notes, another letter was added to the serial number prefix to uniquely identify the note within the note's denomination. This letter is incremented with each series. Thus, serial numbers are eleven characters, starting with the series letter, followed by the Federal Reserve District letter, the eight digit serial number, and single suffix letter. One interesting factiod concerning recent series of the smaller denominations is that the higher serial numbers (say, x95000000x and up) are reserved for uncut sheets sold by the Treasury. Anyone who wants to can buy one of these, either at the Treasury or by mail. You can paper your wall with them, frame them, or even cut them apart and spend them (although given what the government charges for these sheets, it wouldn't be very cost effective). Unfortunately, some enterprising miscreants have been buying these things, cutting them apart incorrectly, and selling them as error notes, as if they were miscut currency. Most currency collectors aren't fooled by this, although many other people apparently are. Another interesting factoid is that since the introduction of the 18 subject sheet, two adjacent notes on an uncut sheet will not bear sequential serial numbers. Serial numbers are in fact assigned sequentially from sheet to sheet, with notes on the same sheet bearing numbers separated by gaps of thousands. This is done so that if one took a stack of one hundred uncut sheets, and bulk cut them, you'd have stacks of 100 sequentially numbered notes without requiring any further sorting. Interestingly, this means that within a block of serial numbers, the higher numbered notes are printed first,so that the lower numbered notes will appear on the top of the stack. You've probably noticed that the serial number is not printed in black ink. For small size US currency, you can generally determine the type of note by the color of ink used to print the Treasury seal and serial number (with some exceptions in emergency currency printed during World War II). Older, large size currency (series prior to 1928) didn't conform to any such convention.